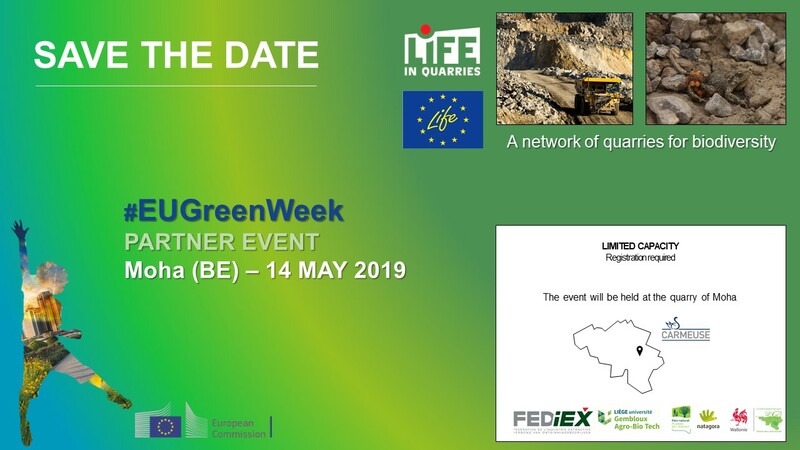 In the Framework of the EU GreenWeek 2019, the LIFE In Quarries is proud to invite you to the partner event on Tuesday 14 May 2019 at the quarry of Moha (Carmeuse). This event is a unique opportunity to learn more about the insights of implementing environmental legislation with an approach of dynamic management of biodiversity in active quarries. Since 2015, the LIFE in Quarries project has been enhancing the hosting capacity of extractive site by developping best-practices, training quarry operators and implementing concrete conservation actions in 27 quarries in Belgium. * Additional information will be sent shortly.